Our gloriously handcrafted Amish Buckingham Partner Desk with Three-Piece Hutch provides ample storage space and room to grow in your business or studies. The fluted angled corners and gorgeous raised panel sides will bring elegance into your home or business. You can share this Amish desk with a partner or spouse or choose to keep all the extra space for yourself. Our Furniture Specialists are standing by to answer any questions you have or to help you order this beautiful desk. Give us a call at 1-866-272-6773. 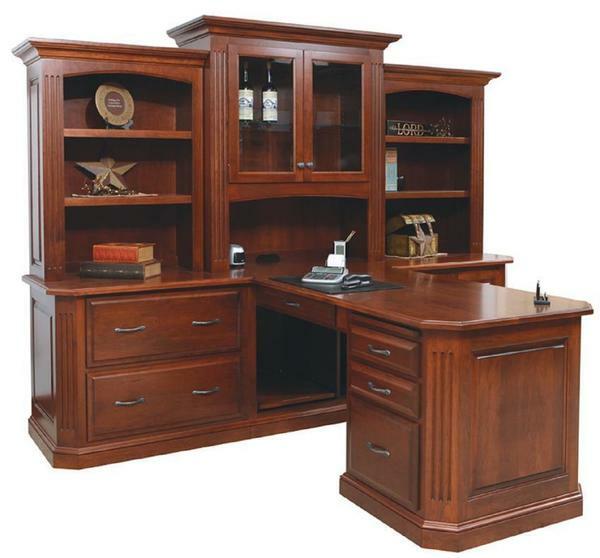 This luxuriously handcrafted Amish Buckingham Partner Desk with Three-Piece Hutch offers ample organizational space to display and categorize your books, files, and all other important documents. This desk and hutch set is handmade in the United States by authentic Amish craftsmen who use only the finest hardwoods in North America. This Amish made desk is one of our most popular desks. Customers like to put this in their executive offices to host meetings with clients. Imagine sitting at this immaculate desk while discussing the business of the day. Be sure to enjoy our blog post, "8 Office Desks That'll Get Your Job Done," for a thorough guide to desk styles and functions. Select an Amish Desk Chair from our large collection to seat you in comfort throughout the workday.